If you ever feel a kick of adventure and want to cover Tibet, Nepal and Bhutan all at once, this is a perfect trip for you! Starting from Chengdu, China, you'll fly to the eastern Himalayas to the mystical Tibetan capital of Lhasa. In Tibet, not only do you see Lhasa where the Potala Palace is, you will also explore around historical monumental places like Tsetang, Shigatse & Gyangtse. 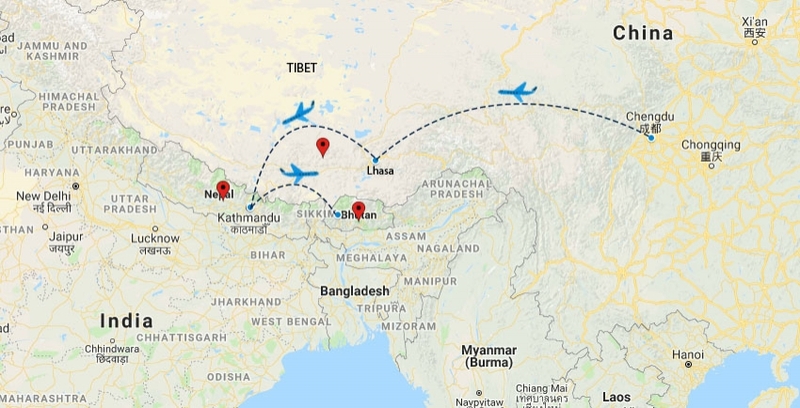 After Tibet, you'll fly to Kathmandu, the capital of Nepal. Just in the vicinity of the Kathmandu valley alone, there are seven UNESCO designated World Heritage Sites, within a 13-mile radius. The heritage sites and museums, stunning mountain scenery, and model conservation and preservation efforts all go to make Nepal one of the most rich and exciting destinations in the world. Next you will fly from Kathmandu to Paro, Bhutan. Enjoy the stunning views of the eastern Himalayan range. Mt. Everest (29,028 ft.), Mt. Makalu (27,815 ft.), Mt. Kangchejunga (28,160 ft.) and a host of other mighty Himalayan peaks. You leave the multitudes behind and enter the Land of the Thunder Dragon. Bhutan offers the experience of the Buddhist tradition in a setting of unique architecture and breathtaking Himalayan landscape. The friendly people of Bhutan share their traditional lifestyle untouched by outside influence. It is a unique opportunity to experience Himalayan Buddhist culture not influenced by the outside world. Day 06 Tour of Potala Palace & Norbulinka in Lhasa. Day 07 Tour of Drepung Monastery & Jokhang Temple. Upon arrival in Chengdu, you’ll be met and transferred to the hotel. Breakfast at the hotel. If time permits, you can take an optional tour of Chengdu Panda Breeding Research Center which is located just 10 km (6 miles) from the city. Transfer to airport and fly to Lhasa. Upon arrival at Gongar airport, you will be met by your local guide and then transferred to Tsetang. Rest of the day at your leisure, and acclimatization. After breakfast, drive to Samye monastery which is 32 miles away from Tsetang, It's the first monastery and one of the most important monasteries in Tibet. Afternoon drive back to Tsedang and visit the palace of Yambulakhang which was built by the first Tibetan king Nyatri Tsenpo in the second century. As per the local folklore, the king was descended from heaven . Next you will visit Chedruk Temple before you round off your your tour to Tsetang. After breakfast drive to Gyangtse via Yamdrok Tso which translates to “Turquoise Lake”. In Gyangtse, sightseeing tour of Pelkhor Chode (Kumbum), known as 'monastery with praying wheel’ and then proceed to Shigatse in the afternoon. In the morning, you will visit Tashilunpo monastery. This is the official seat of the Panchen Lama, second in importance to only the Dalai Lama. The monastery itself was built in 1447 by Gendun Drup and once housed up to of 3400 monks. A spectacle of the monastery is the nine foot statue of Maitreya, the Buddha of the Future. In the afternoon you will drive to Lhasa and check in hotel. Today will be spent exploring famous monuments in Lhasa. First on your list will be the Potala Palace. The palace of the Dalai Lama,a treasure of Tibetan culture was, till 1965, the seat of both religion and politics in Tibet and quite possibly, the singularly most important building in all Tibet. It was built in the seventh century by Tsongtsen Gampo as a fort and later renovated by the fifth Dalai Lama in the seventeenth century to its present specification. Note: Due to high volume of tourists from May 01 through Oct. 31, you are allowed to stay inside the palace for an hour only. This rule applies from Potala White Palace East Big Courtyard (IN TIBETAN DEYANG XIA) to Potala Red Palace West Big Hall (IN TIBETAN DEYANG NUP). This rule may change anytime. Your next stop will be Norbulingkha, the winter palace of the Dalai Lama which was built in the eighteenth century. Today you will visit the Drepung monastery. This is the largest monastery in the world and once housed 10,000 monks and nuns. It was built in 1419 and the second, third and fourth Dalai Lamas' lived and were later entombed here. Your next stop will be the Jokhang Temple. This is the holiest shrine in Tibet and houses a golden statue of the Buddha which was brought to Tibet by the Chinese princess “Wen Chen”. You then stop off at Barkhor Bazaar outside the Jokhang monastery. This is a bustling flea market and is, generally, the place to buy souvenirs and meet other tourists. Transfer to airport and fly to Kathmandu, one of the most spectacular flights in the world with amazing views of peaks including Mt. Everest. You will me met upon arrival in Kathmandu and transferred to hotel. Today you have the half day tour of Pashupatinath & Bodhnath. Situated near the banks of sacred Bagmati River, the temple of lord Siva-Pasupatinath with two tiered golden roof and silver doors is famous for its superb Newari architecture. Bodhnath; This colossal and ancient Stupa is one of Nepal’s most unique monument and is said to be the world's biggest. The stupa attracts Nepalese pilgrimage of Tibetan community from as far as Dolpo and Mugu as well as Tibet, Ladhak in India and Bhutan. Evening walk around Thamel, a tourist hub in Kathmandu, with colorful souvenir shops, restaurants, pubs, book stores and cyber cafes. Morning tour of Swambhunath, a 2000 year-old Buddhist monument on a hilltop overlooking Kathmandu Valley. Surrounding the hemispherical Stupa are many temples and pagodas and a large band of monkeys. Your next stop is Patan, which is also known as Lalitpur. “Lalitpur”, translating to the city of fine arts, is perhaps a living museum as she still retains her medieval air of the ancient times and almost half the inner city residents are craftsmen in their own right. Patan was one of the major Buddhist cities in Asia by the 7th century as pilgrims, scholars and monks from India, Tibet and China visited the city. It is said that at one stage the entire population of Patan city was comprised of monks and craftsmen only. The city is full of Hindu Temples, Buddhist monuments and structures with bronze gateways, guardian deities and wonderful Metal and wood carvings. Continue to Bhaktapur, also known as Bhadgaon. The tour visits: Durbar Square, the main palace square of the city containing many temples and other architectural showpieces, including the Golden Gate, described as the finest piece of art in the Kingdom. Nyatapola Temple, The five-storied pagoda style temple built in 1708 AD. the largest and the most famous example of Nepalese pagoda architecture. Dattatraya Temple, a temple dedicated to Lord Shiva built in 1427 AD. Nearby is the monastery with exquisitely carved windows, which now serves as the National Work Museum. Transfer to airport and fly to Paro in Kingdom of Bhutan. Enjoy the breathtaking views of the Great Himalayas from the flight. Upon arrival at Paro International Airport, you will be welcomed to the Kingdom by your guide. If time permits, sightseeing tour of 200-year-old Watch Tower that has been renovated and converted into National Museum in 1968. It houses a fine collection of national costumes and fabrics, gallery of Thangkas, an impressive stamp gallery with three dimensional and CD stamps issued as early as 1960 that are remarkable, and other galleries showcasing armor and silverware with the handsome Royal teapots. On the top floor there is a four-sided temple complex depicting the history of Buddhism and its propagation. Then visit the Dungtse Lakang on the same route. Later drive to Thimpu through the Paro Valley. The drive from Paro to Thimphu is spectacularly scenic. Thimphu is the only Capital City in the world without traffic lights. Enjoy magnificent monasteries and Stupas in the valleys and mountain tops. Experience the "Last Buddhist Himalayan Kingdom" on Earth. Visit to the Memorial Chorten built in honor of the late King Jigme Dorji Wangchuk, Dupthop Lhakhang ( Monastery for the nuns), National Library and the painting school where traditional art is still kept alive through instructions in the art of painting Thangkhas ( sacred Buddhist religious scrolls). Visit the traditional Medicine institute where medicines are prepared according to ancient practices. Visit Lungtenzampa to observe the Royal traditional silver smiths and Bhutanese traditional paper factory. Drive south and visit Simtokha Dzong, the first Dzong built by Shubdrung Nawang Namgyal. It is now used as the Institute for study of traditional teachings. Afternoon drive to the ancient capital of Punakha, through Dochula Pass (10170 ft.). The journey is beautiful, as the fragrant air blows from the pink cherry trees and splashes of pink color through the orange, red and dark green forests. Sightseeing of Punakha, which was the winter capital for over 300 years until the time of second King. Punakha Dzong which dominates the whole area was built in 1637 by Shabdrung Nawang Namgyel, and established the central monastic body with 600 monks. Today, Punakha is still the home for Je Khempo (Chief Abbot) and the central monastic body. Drive to Wangdi Phodrang valley for sightseeing. Visit the only Dzong with wooden roof maintained in its ancient style. Walk around Wangdi town and have lunch. After lunch, drive to Thimphu. En-route, visit Simtokha Dzong, the first Dzong built in Bhutan by Shabdrung Nawang Namgyel in 1629. Since 1961, it has been the institute for religious and classical studies. Drive back to Paro and overnight. After breakfast, your guide will take you to the starting point of the hike to view the spectacular Taktsang monastery (Tiger’s lair). The trail to the monastery climbs through beautiful pine forest, many of the trees festooned with Spanish moss, and an occasional grove of fluttering prayer flags. Stop at the cafeteria for a rest and refreshments and continue the hike for short while until you see, clearly and seemingly within reach, the remains of Taktsang monastery. Built in 1600s, this incredible monastery clings to the edge of a sheer rock cliff that plunges 900 meters into the valley below. The history states that Guru Padmasambhava, the Tantric mystic who brought Buddhism to Bhutan, landed here on the back of a flying tiger. Looking at the monastery flying tigers doesn't’t seem so impossible after all. In Paro, visit Drugyel Dzong, although mostly now in ruins. Built in 1647 by Shabdrung Nawang Namgyel to commemorate the victory over Tibetan Invaders, which indicates by the name of the Dzong meaning Victorious Bhutanese Fort. Visit Drugyel High School and Kychu Lhakhang, the oldest monastery in the valley built in 7th. century. From this point we see the spectacular views of Mt. Jhomolhari which is considered sacred. After breakfast, transfer to airport, fly back to Kathmandu and connect your flight to U.S. or extend your trip to India, Myanmar or Thailand. All Applicable local & govt. taxes. Air from & to U.S.
Any other expenses that are not specified. Yes, we can arrange your flights from/to U.S. You just need to email us your full name as it appears on the passport and departure city. We will then send you a quote for the flight. To issue the ticket, we just need your credit card details. The sooner you book, the better it is, because getting lower airfare from U.S. is higher when you book well in advance. Also, it is hard to get seats on some of the internal flight if it is closer to departure date. You can usually make the international flight reservation nine months prior to your departure date. Yes, you need a visa for China which you must obtain before you leave U.S. In additional to Chinese visa, you also need a Tibet Travel Permit, which we will get that for you. You can get the Nepal visa upon arrival at China-Nepal border or airport in Kathmandu. We will also take care of your Bhutan visa. All the permits and entrance fees are included in the tour. Spring and Fall are the best time to travel to this region. The weather generally stays nice and sunny, and the the chance of rain is very low during spring and fall. Though it may be a little chilly at night in Tibet and Bhutan, this is the prime time for the views. At the time of booking, you need to send us $ 350.00 deposit with a trip application form. $1000 is due 3 months prior to departure, and balance is due 2 months prior to departure. We usually keep our groups small, so you will get the personalized services from local guides. There must be minimum of 2 people to run the trip, and the maximum is 10 people per group. This is a moderate adventure trip. However, you have to be physically fit to do this trip. You will be spending from around 8 AM to 4 PM touring around, going from one place to another taking scenic drive and enjoying the world famous monuments/heritage sites here and there. There is only one short hike to Takshang Monastery in Bhutan at the end. The average altitude in Tibet is 11,000 ft. If you have experienced the altitude sickness before in the altitude, please do consult with your physician. We strongly recommend you to purchase the travel insurance which protects you, in case if you had to cancel the trip or other reasons like flight delay, flight cancellation, and medical evacuation. Once you book the trip, we can send you a Travel Insurance Quote. You can either buy through the link we send you or from your other insurance companies. What about accommodations & meals? You will be staying in nice, comfortable accommodation with attached bath. Your breakfast is always included. Lunch and dinner are including only in Bhutan. In Tibet and Nepal, the guide will be suggesting you where you can eat lunch or dinner. A decent meal will cost you about $ 8-12 in tourist class restaurant. We provide experienced drivers and English speaking local guides in all these places. You will be traveling in comfortable private car,van, or mini bus depending on the number of people in the group. Yes, you can extend your trip to trekking in Nepal, or tour in India, Myanmar or other destinations in Asia. We would be happy to arrange one for you. Can we make this a private trip on our own date?